I actually just slammed the hard cover shut and announced (to an empty room) “nope, not doing this”. I’m sorry, Vera Nazarian, I tried. I get that there are certain people out there who adore reading novels of a poetry-eque nature, where the words flow off the pages as if played on an ocarina by a flipping fairy. But egads, I am not one of those people. I was excited for this book, I really was. The cover leaves a lot to be desired (a course in Photoshop being the first thing that springs to mind), but the plot sounded good. Death needs a bride so he stops all dying until one is found? Bait taken, reel me in please. But wherever this supposed plot was, it was buried under mountainous pages of purple prose; some of it good, some of it less so. Oh the first chapter had fair intrigue, don’t get me wrong. A bloody battle on a frozen lake and no one can die? Awesome! An extensive family background the second we meet the character..? I nearly got to the 100 page mark and nothing even remotely interesting had happened after chapter one. We open with Death stopping death in the first chapter, now people can’t die. No one’s really doing anything about it, to be frank. My mind has blanked most of what I read, that is how boring I found it. All I remember are utterly tedious chapters about members of some aristocracy striking poses reminiscent of an oil painting and engaging in some of the shittest dialogue I have seen in recent years. I don’t care if your story takes place in the 13th century or what have you, and it’s true I have no way of knowing if people actually spoke like that in day-to-day conversation, but dammit it is still painful to see dialogue like that! Even if the language can’t be colloquial or even vaguely modernised, make it interesting love! And while you’re at it, sort out your flipping punctuation; it’s embarrassing. I didn’t have the stamina to go on reading. Hopefully the plot rears its head at some point, though I doubt the purple prose eases up at all. No disrespect if that’s your thing, but for me any shred of plot decency is completely overshadowed by the execution. Purple prose is one of those things to be taken in moderation. Too much of it will kill my enjoyment of the story. It is unnecessary, constantly hit-and-miss and above all it is so damn boring. 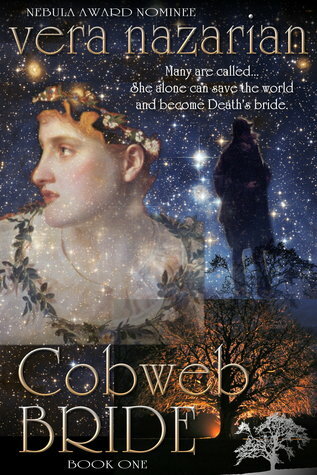 I received a copy of Cobweb Bride in a Goodreads Giveaway. This (clearly) does not affect my opinion of the book.